The Equal Rights Blog Hop Continues: And Sarah Madison does a Blog Talk Radio Interview! Oh my! I’m pretty stoked about this! 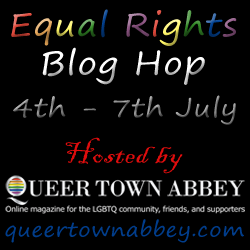 The Equal Rights Blog Hop continues through this weekend–from now until July 7th! There nearly fifty authors participating in this first annual event, with several Grand Prizes being awarded as well. For all the details on how you can enter to win, check out the link for the main page above! If you’re here for my own post, check out this link here! Leaving a comment on my post there will enter you to win an autographed copy of The Boys of Summer–see the post for all the details! In the meantime, tonight I will be doing a Blog Talk Radio interview with Write on the Edge! It’s going to be recorded–I will provide a link when I get it! I have to say, I’m pretty excited and just a little bit nervous too! I received a stack of questions and was asked to select twenty to be discussed on air. But there were many more I didn’t choose–too many to do them all! Want a sample? I thought so! Here’s one selected at random: Who would play you in the film of your life? To get the full effect of this, you’ll have to check out these links, as I can’t post pictures of celebrities here unless they are royalty free. However, I recently posted this on a discussion about my hair on Twitter. 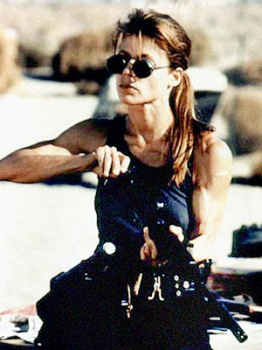 I’d want Linda Hamilton to play me. Hamilton as she was in the Terminator 3.You know the picture I mean. The one where she’s wearing the sunglasses and the tank top and she’s got those amazing arms as she is prepping her weapon. A more realistic actress to play me in the story of my life, however, would be Mary McDonnell. You know, President Laura Roslin on Battlestar Galactica. Captain Sharon Raydor on Major Crimes. Yep. She’d make a great me. 🙂 I hear she’s kind of busy though. Right! This is just a taste of what you’ll get in the interview tonight! Don’t worry if you miss it–I’ll provide the link and you can check it out at your leisure! But do come back for that link when I post it later today! UPDATE: Here’s the link to the Blog Talk Radio event! The only logical answer to that is soon, baby, soon! This entry was posted in Uncategorized and tagged announcements, blog hop, contests, interviews, Sarah Madison, The Boys of Summer by Sarah Madison. Bookmark the permalink. Lol, loved the post. I love Sharon from Major Crimes, I’m now addicted to that show. Thanks for participating! I love Major Crimes too! 🙂 We need more strong female characters like Sharon Raydor. Sarah Madison recently posted..The Equal Rights Blog Hop Continues: And Sarah Madison does a Blog Talk Radio Interview! I just listened to the radio show. It was great hearing you again. The interviewer asked some good questions, and I thought you provided great and well thought out answers, as you always do in your posts. Great job!